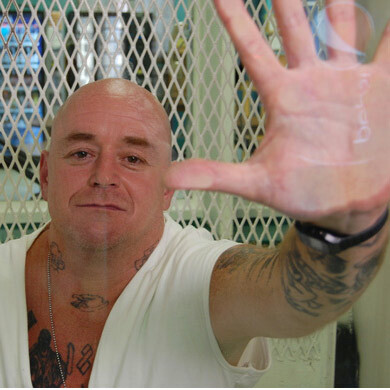 On April 5, 2002, Mark Anthony Stroman, a 32-year-old stonecutter from Dallas, entered Texas’ death row for the murder of Vasudev Patel, an Indian immigrant and gas station owner in Mesquite, TX. Patel was Stroman’s third and final victim. In the three weeks after the September 11th terrorist attacks, Stroman also shot and killed Waqar Hasan, a Pakistani immigrant in Dallas, and partially blinded Rais Bhuiyan, a gas station attendant from Bangladesh, in the erroneous belief that all three men were Arabs. The press labeled the murders, Texas’ first post 9/11 hate crimes. Stroman himself claimed that “blinded by rage,” he killed to avenge the United States. The prosecution convinced the jury that robbery was his true motive, (even though he hadn’t taken money from his victims), and he was sentenced to death. Then, Rais Bhuiyan, his only living victim came to his defense. Ilan Ziv was born in Israel in 1950 and came to the United States after fighting in the Yom Kippur (The October) War in 1973. Ilan Ziv is a graduate of New York University film school, and in 1978 he co-produced New York's first Middle East Film Festival. That same year he founded Icarus Films, a documentary film distribution company, which he left in 1980 in order to devote himself to making documentary films, and since then he has directed dozens of documentaries dealing broadly with issues of human rights and investigations of contemporary history. Some of Ilan's past films include Capitalism, Exile A Myth Unearthed, Jesus Politics: The Bible and the Ballot and more.